"Make sure when you make this recipe, that you place baking paper in the tray while baking. The first time I did this was without baking paper. Trust me, this is not what you want to be scraping out of the tin. Finding it hard to give up carbohydrates? 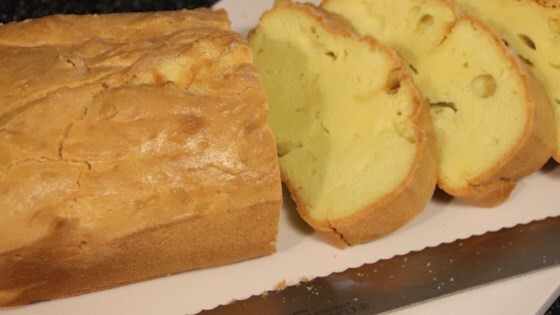 This keto bread makes the switch much easier, so you can still have sandwiches and toast." Preheat oven to 350 degrees F (175 degrees C). Line a loaf pan with parchment paper. Beat eggs in a bowl using an electric mixer on high until frothy, 1 to 2 minutes. Add butter and coconut oil; continue beating until smooth. Mix almond flour, baking powder, xanthan gum, and salt into egg mixture until dough is well mixed and very thick; transfer to the prepared loaf pan. Bake in the preheated oven until a skewer inserted in the center comes out clean, about 45 minutes. I added an egg and used chia seed in place of xanthum ( however its spelled) gum. I LOVE it I now make it about once a week. I've tried a few low carb bread recipes, this is by far the best. Moist and holds together. Not normal bread, but it works for lchf. I used hazelnut meal flour instead of almond flour. I used 5 eggs and 2 egg whites, a little milled flax seed and 2 tsp baking powder. It is delicious. Great for Keto & Paleo.